NMC Fall Festival Oct. 10 – New Location! Free event in the lobby on the north side of the Health & Science Building (updated location!). 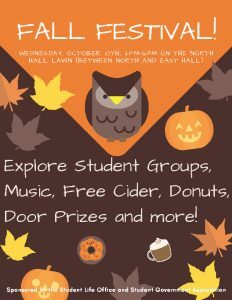 This event is a great opportunity to see what’s happening with all of our active student groups, along with live music, free cider and donuts, a henna artist, pumpkin decorating, and more.